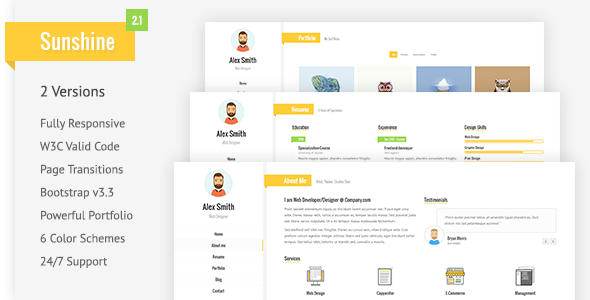 Sunshine Resume / vCard / CV / Portfolio HTML Template — A premium tool to promote yourself. Ready to look stunning on any device – from a widescreen monitor to a mobile phone. 6 Beautiful Color schemes are built in and its easy to set any color to elements such as links, buttons, menu links, etc. You can get this template customized by us, at low fees, so if you want to hire us, contact us via contact form on our profile page. Note: Some images are only for demo purpose and not included in the download bundle. Included: 4 service icons & 2 testimonial author illustrations (PNG files). fixed : Owl Carousel bug (jQuery version was changed from 3.1.1 to 2.1.3). 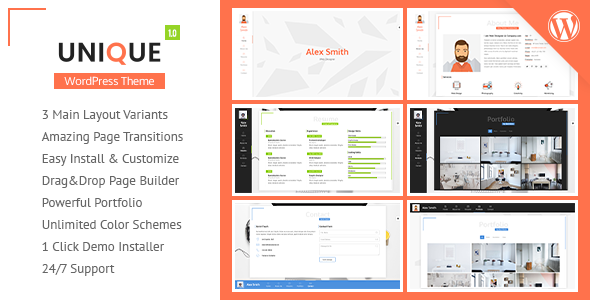 added : 5 new color schemes.